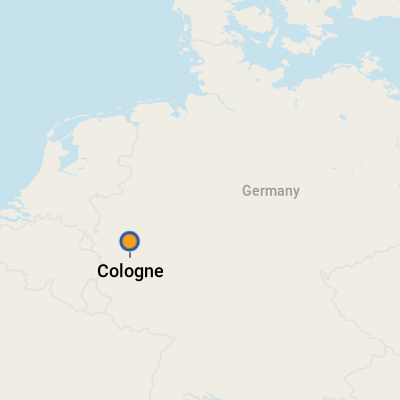 Cologne, the Rhineland's largest city and Germany's fourth-largest, dates back to 38 B.C., when the Romans first started to settle in the area. By 50 A.D., "Colonia" was a major city, which would later become one of the most important trade and production centers in the Roman Empire. Significant Roman ruins can still be found in Cologne today, especially near the city's wharf area, in addition to 12 Romanesque churches. Cologne's location on the river Rhine placed it at the intersection of the major trade routes between east and west, which was the basis for its continued growth through the Middle Ages. Construction of the famous Kolner Dom, the city's Gothic cathedral, started in 1248, consolidating its position as a place of great religious significance, as well as a trade hub (despite the fact that work stopped on the cathedral in 1473, leaving it unfinished until the 19th century). Today, Cologne is the cultural heart of the Rhineland, with a vibrant arts scene, celebrated opera house, more than 30 museums and hundreds of galleries. The city has spread to both sides of the Rhine River, with the cathedral and Altstadt (Old Town) both located on the left bank. The cathedral is the largest Gothic church in Northern Europe and became a poignant symbol of the city's survival of the Allied aerial bombing during World War II. While some 95 percent of the city center was destroyed during the war, much of its medieval heart and churches were rebuilt according to original plans. Because of this, Cologne retains an authentic feel, with attractive open squares, pretty beer gardens and cozy wine taverns lining narrow, cobbled streets and the attractive riverfront. Cologne is celebrated for its locally brewed beer, called Kolsch, with about 30 traditional brewing houses creating their own versions and selling them on-site in lively beer gardens and cellars. (Kolsch is also the name for the local dialect, resulting in the joke that Kolsch is the only language one can drink.) Considerable quantities of Kolsch are consumed each November, when carnival season transforms the city into one of Europe's biggest street festivals, with the numerous bars and pubs on Neumarkt square, Heumarkt and Zulpicher Strasse packed with people in costumes, dancing and drinking. Whether you visit Cologne during the summer to make the most of the beer gardens and pretty landscaped riverbanks or during winter for the raucous Carnival or magical Christmas markets, you'll discover an intriguing, cosmopolitan city with bags of character. Furthermore, Cologne has a compact heart, which is easily navigated on foot, making it the perfect destination to explore from a cruise ship. The precise mooring point given to river cruise ships arriving in Cologne is determined by the local port authorities upon arrival, but the locations basically stretch about a mile along the embankment between the Chocolate Factory and the city's central railway station. This location ensures the cathedral will be about 5 to 10 minutes' walk from your ship's berth and places you in the heart of the Old Town, perfect for popping out for a pre-dinner drink or post-prandial stroll. The Old Town's strip of lively bars and restaurants along the Rhinegarten embankment makes for a perfect place to enjoy a drink or meal. Follow the steps and footpath that lead from the north end of the strip, just before the Hohenzollern railway bridge crosses the river, to the cathedral and Cologne's pedestrianized shopping street, Hohe Strasse. The tradition of Love Locks is said to have originated on the Ponte Milivio in Italy. Sweethearts stroll across a bridge together, afix a lock inscribed with their names to the structure and then toss the key into the river. Indeed, the Hohenzollern Bridge is so covered with padlocks that the bridge's operator threatened to saw them off until public outcry forced a change of heart. Local lads will often tug on the padlocks as they cross the bridge, so if you and your sweetheart do fix a Love Lock to Hohenzollern, make sure it's well attached, or your heart will be broken! On Foot: Virtually all of Cologne's tourist attractions are within an easy 15-minute walk of the river cruise moorings. By Tram: Cologne has an efficient, safe underground tram and bus network. Short journeys (up to four stops) only require a "Kurzstrecke" (short trip ticket), but if you're planning to explore farther afield, one- and three-day passes are available for use across the system. By Bike: If your cruise ship doesn't have bicycles you can use, you can hire one for the day very easily from the "Radstation" (bike station) in the city's main railway station from 5 euros for three hours. By Taxi: Taxis are fairly easy to find near the Cathedral square. They run on meters. Transport from / to the airport: Dusseldorf Airport is the best international hub for Cologne, located a 40-minute train ride from Cologne central station. Direct train services run frequently between the airport and central station and cost approximately 30 euros. Visit www.bahn.com for train times and costs and to pre-book your tickets. Germany's currency is the euro. Visit XE.com for current rates. ATMs and banks are plentiful, particularly around the cathedral, which is within walking distance of most river cruise mooring points, and credit cards are widely accepted in restaurants, bars and shops. German food has a reputation for being hearty and somewhat stodgy, with an emphasis on meat ("Wurst" or sausages, in particular), potatoes (Germany is one of the world's top potato-consuming countries) and bread. There is considerable regional variation, with the culinary influences of the country's international neighbors reflected in local dishes. Thus, in the Rhineland region, you'll pick up hints of Belgium and the Netherlands in dishes like Halver Hahn (a giant slab of Dutch gouda with a Roggelchen or rye roll) and Dicke Bunne mit Speck (boiled white beans with hefty boiled bacon slices on top). Cologne boasts a decent selection of international restaurants in addition to traditional ones, but you shouldn't miss enjoying at least one locally brewed Kolsch (beer) and some nibbles in one of the city's old brewery taps in the Old Town, preferably sitting in the sunshine on the Rhinegarten embankment. Buy a bottle of the original Eau de Cologne, the citrusy perfume first launched in the city in 1709 by the Italian perfumer, Giovanni Maria Farina. Today, Farina's eponymous shop on Julich's Square is the world's oldest fragrance factory and still sells bottles of what used to be called its aqua mirabilis (Latin: miracle water). Fortunately, while vials of Farina cost half the annual salary of a civil servant back in 1709, you can pick up little sample bottles today for a just few euros.